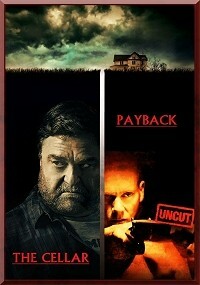 Death Sentence (Payback) is cut to an action full roller-coaster of 58 minutes. I cut the melodrama in this and the original is not very realistic at some scenes so i tried to create a more believable cut. 10 Cloverfield Lane (The Cellar) is now without the Aliens and Goodman is in this cut a crazy delusional character. This cut is also more about Abduction, loneliness and Lies. Another fantastic edit by Maniac, great way to enjoy these two movies.